Greenwich United Way women’s initiative “stepped up” to collect “new” and “gently used” shoes for the Organization’s partner agency, Neighbor to Neighbor. Shoes were collected at close to a dozen Greenwich based locations, including schools and businesses. Shoes for men, women, and children in all sizes were donated with a goal “to help others step forward”. GREENWICH, Conn.,– The Greenwich United Way Sole Sisters teamed up with Neighbor to Neighbor in late February into early March to host a town-wide shoe drive for low-income families based in the Greenwich community. The shoe drive ran from February 26 until March 9, and collected over 1,000 pairs of ” new” and “gently used” shoes. The drive took place across several locations in Greenwich including private and public schools, Mane Event Salon, Temple Shalom, First Presbyterian Church, the Greenwich United Way office, the YWCA of Greenwich and Neighbor to Neighbor. 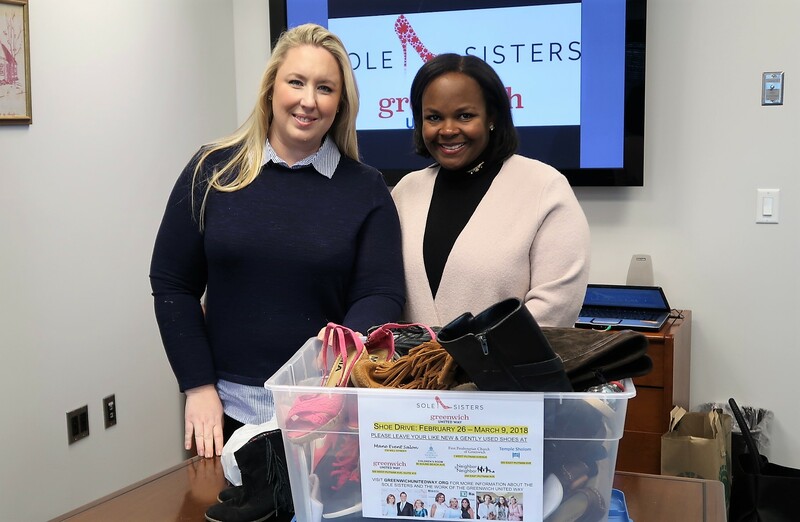 Spearheading the shoe drive was 2018 Sole Sisters Luncheon committee members, Kirsten Riemer and Olivia Langston. “We are so fortunate to live in such a giving community! The support and generosity of the Sole Sisters initiative is nothing short of overwhelming and we are thrilled that so many in need will benefit from our work,” said Riemer. The 13th Annual Sole Sisters Luncheon will take place later this month at Greenwich Country Club. Chairs, Jaime Eisenberg and her Co-chair, Grace Lockhart Djuranovic, invited Melissa Bernstein of Melissa & Doug toy brand to keynote the event. Bernstein is the co-founder of Melissa & Doug and a leader of the Take Back Childhood movement. Melissa & Doug grew from a fuzzy farm puzzle to the $400+ million company it is today. Melissa is a mother of six – she dreams of a day when kids are free from over scheduling, undue pressure, and digital distractions so they may develop into free thinkers and realize their full potential. Each year, the Sole Sisters raise money to serve a specific need in the community. In the past, those services have supported children, youth, families, seniors, individuals in crisis. The increased demand for basic human services as a result of the budget cuts taking place at the federal, state and local levels has made this initiative even more critical. This year the Sole Sisters are proud to support the Greenwich United Way’s leadership efforts in supporting community solutions in the areas of education, self-sufficiency, and health. The Luncheon also features a vendor boutique that will open to the public at 9:30 a.m. and include items from Catherine Beth Jewelry, Diptyque Paris, Eleanor Stone NYC/Laurie Berg Designs, Everything Rosey, Fahey Fine Jewelry, Fair Harbor, Good Threads, Groove, Havapassion, Ilyse’s Pieces, Lera Jewels, Oliphant, Paper Alley, Red Fox Gallery, Soxfords, Tambra Sea and Botanicals, The Chintz Giraffe and Tibi. 2018 Luncheon sponsors as of the date of this release include Acxiom Corporation, Deutsch Family Wines – Fleurs de Prairie, Berkshire Hathaway HomeServices New England & Westchester Properties, Case Study Brands, Rosenthal Memorial Chapel, Saks Fifth Avenue, green of greenwich, Shreve, Crump & Low, Hobbs London and Moffly Media. The Sole Sisters are a dynamic and committed group of prominent women and philanthropists, who do more than raise funds in support of the Greenwich United Way’s efforts. They take the time to learn about the needs in their community and how those needs are addressed by local agencies partnering with the Greenwich United Way. While the group is serious about making a difference in the community they all share, they also believe it is important to have fun in the process. That’s why their logo is a shoe! And their motto is “Women Stepping Up to Help Others Step Forward.” The Luncheon is the Sole Sisters’ primary annual fundraiser, and since its inception over 10 years ago, the event has raised over $1.5million in support of the Greenwich United Way’s efforts. While the Luncheon features a fashion and home accessories boutique, most importantly, there is always a notable guest speaker that inspires the sold-out crowd 400+ women and men attending. Each year, the Sole Sisters keynote speaker inspires this very influential, philanthropic group. From Greenwich or any one of our neighboring towns in New York, they come to be inspired by someone they admire, someone who has gone above and beyond professionally, personally, and for the benefit of others and someone who shares their commitment to service and the community. Past speakers have included: Gretchen Carlson, Arianna Huffington, Susan Fales-Hill, Kayce Jennings, Gayle Tzemach Lemmon, Gloria Vanderbilt, Jeannette Walls, Linda Fairstein, Sara Moulton, Lynn Sherr, and Lisa Birnbach.